Imagining where I’d find respective squad members on this season’s journey; a small old market town, in a tranquil rural setting, was not really top of my list. For many of the1982 players, the pick of the possible destinations leapt easily from my research notes to the planning table. With Worrell however, the appealing options were as varied as the thoughts racing round my head. He’d simply had many good seasons away from Vicarage Road, often becoming a fans favourite. Born in Bethnal Green; Worrell was brought up in Kilburn, beginning his football career with local Sunday youth side, Kilburn Rangers. In 1978, Kilburn’s then coach arranged a match against Tom Walley’s U14s and in the aftermath, five boys were invited to Vicarage Road for trials. Worrell wasn’t one of them. His chance only came later, when the mother of one of the lucky five, informed the Welshman of his error. By the time Worrell eventually signed schoolboy forms, a year later, he was the only one of the six still in Watford’s plans. A clear beneficiary of both Graham Taylor’s youth policy and Tom Walley’s mentoring; Sterling was a 1982 FA Youth Cup winner against a strong Manchester United side featuring Blackmore, Hughes and Whiteside. A year on, he made his first team debut at Old Trafford and four games later, played a pivotal role in the legendary final day victory at home to Liverpool. Despite having phenomenal ability and having “kept Cally out for a bit” – like others of his era – his chances were severely limited by those ahead of him in the pecking order. “I wanted to play games, regularly” Worrell told me of his move to Peterborough, who were in 1988, the only team to come in for him. An extraordinary five seasons – under five different managers – brought Worrell and Posh achievements they both craved. It also afforded the gifted winger notable prominence in the region which is yet to be forgotten. Worrell identifies being at London Road at “the right age” and in “consistent form, as key to this success. On top of incredible cup runs – and meeting his wife Jackie – Sterling’s Peterborough were promoted twice, including a first ever trip to Wembley for the 1992 Play-off Final, where Ken Charlery bagged both Posh’s winning goals. An ever-present throughout this period, Worrell would also help Peterborough to what is still their highest ever league finish a year later. Just a few months later Worrell became one of Bristol Rovers’ new manager, John Ward’s big signings. 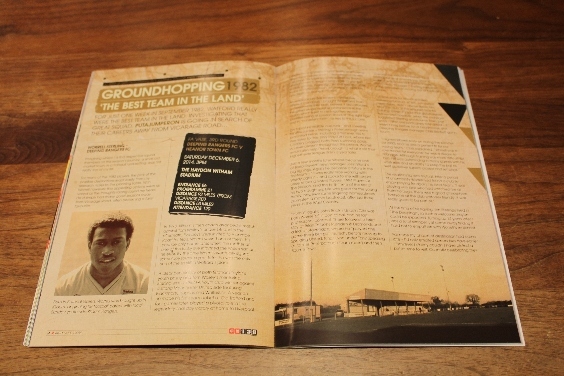 Again he became a fixture in the first team – “It was really nice working with Wardy again” – and spoke to me with equal pride of being voted Rovers’ 1994 Player Of The Season and, the birth there, of the first of his two daughters. Life was good for the young family however; some lingering homesickness promoted a move back east, after just three years in the West Country. 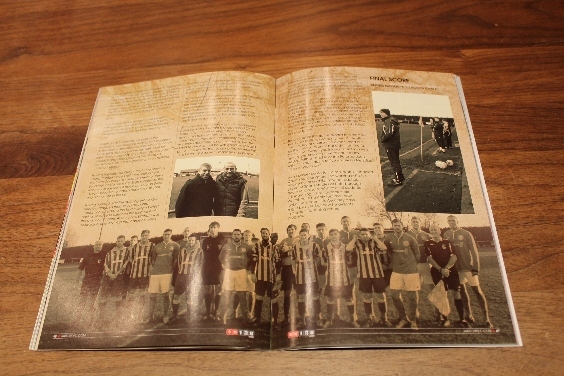 “Home” again; John Beck’s Lincoln City was both Worrell’s first port of call and his last professional contract. There followed a brief stay at Brain Talbots’ Rushden & Diamonds and a trial at Stevenage where he “played one game there but got injured”, before moving to Spalding United, Kings Lynn under Tony Spearing (a former Peterborough team mate) and then Bourne Town. “Towards the end of my career, I was working full time and training once a week. It was a new ball game; it wasn’t always easy to juggle.” Sterling explained of the difficulties of moving out of football’s bubble. Full time work for Worrell entailed delivering furniture which, somewhat predictably, didn’t always leave him near the club at the required time for training. 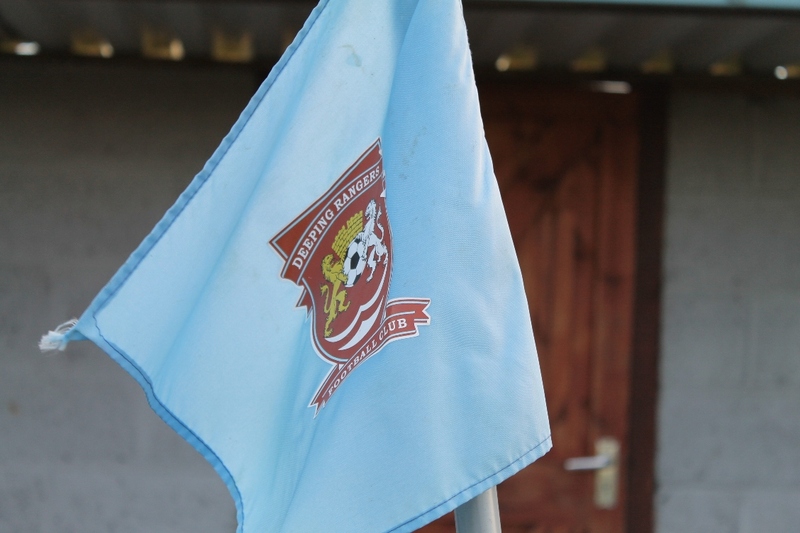 Given it’s said that good always follows bad however… when the manager suggested Sterling and Bourne Town part ways – after one particularly late arrival – it wasn’t long before local headmaster and Deeping Rangers manager, Chris Beckett, got in touch. At the time of his signing, the Sterlings lived in “The Deepings”, so such a welcome maybe could be expected. Turning up fourteen years later, I was total stranger, yet came away finding it hard not to empathise with Worrell’s sentiment. For once my choice of destination had come late – I’d only emailed ahead two days earlier – however I clearly couldn’t have picked a better time to visit. 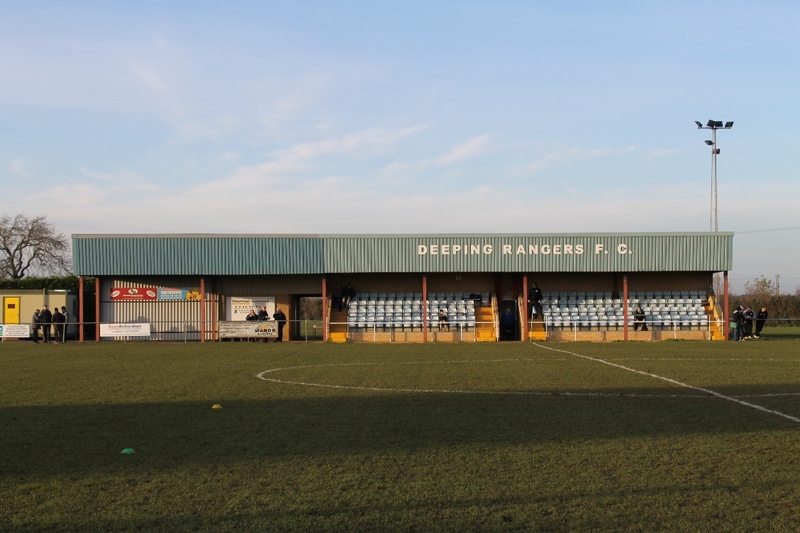 Currently celebrating their 50th anniversary, Deeping Rangers FC, began life in the Peterborough Sunday League. Two years later they lifted both the Peterborough & District League Division Three (North) title as well as the PFA Minor Cup. 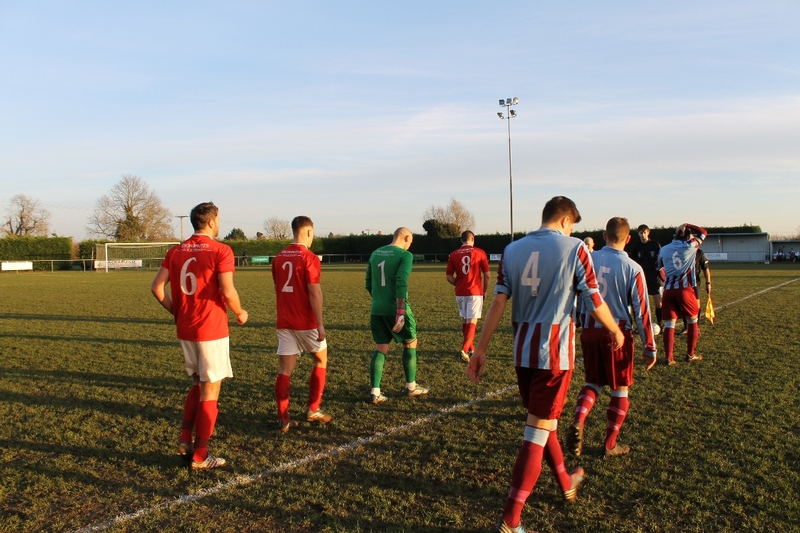 Promotion to the United Counties League was achieved by the millennium and, the FA Vase entered for the first time in Worrell’s second season donning Rangers’ claret and blue. 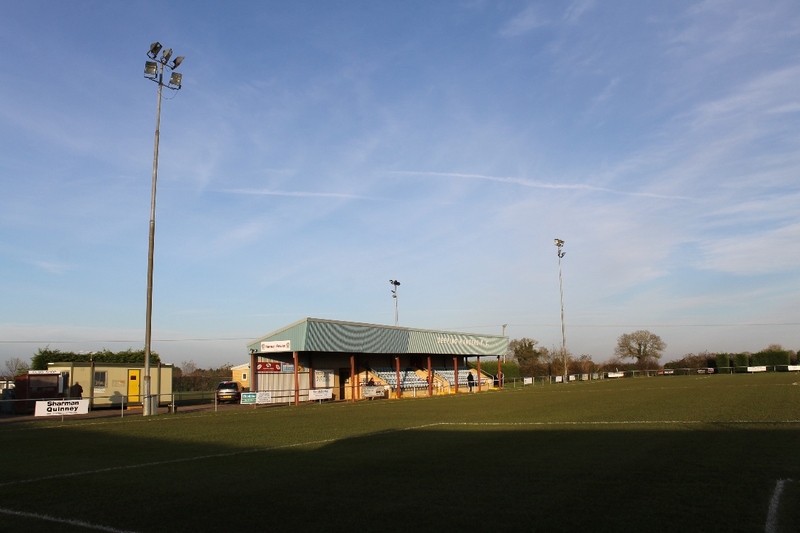 The stadium itself is located in the beautiful Fenland, just north or Peterborough. It sits to the east of the site which is also home to Market Deeping Cricket Club and the Deeping Tennis Club. Alright so distracted by the sight of the floodlights, I’d missed the turning and, struggled as the satnav attempted to then steer me across local fields but once in the car park, it just felt right. 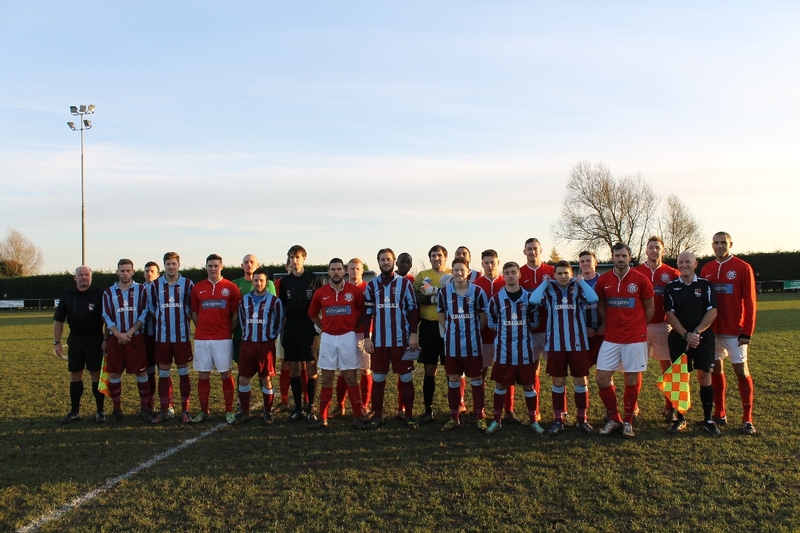 The sun was shining, I’d been invited onto the pitch and photographed the “Football Remembers” joint team grouping; surely nothing could go wrong? 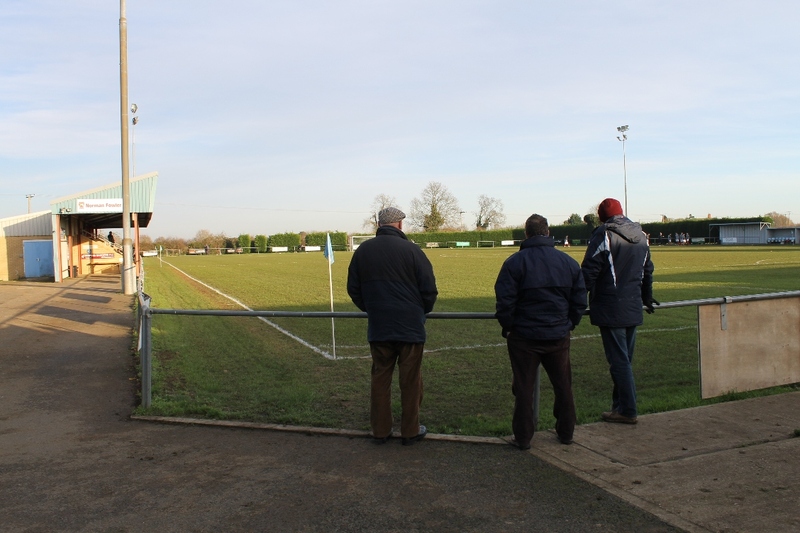 Having knocked out Oxhey Jets in the previous round, Rangers faced stiff competition from Northern Counties East League’s Heanor Town (and their boisterous fans). Eight minutes in, the enormity of the task hit home as a Kieran Wells twenty-yard pile driver evaded keeper Dan Bircham and hit the roof of the net. Having handed over the opening exchanges Deeping dragged themselves back into contention, energising the home support whilst having an adverse effect on the language of the away contingent. At the back Bircham was deftly equal to everything that came his way in that first period; sadly Rangers failed to capitalise up the other end. Charlie Coulson had the best effort, just before the break, but Ian Deakin tipped his shot over the visitors’ bar. 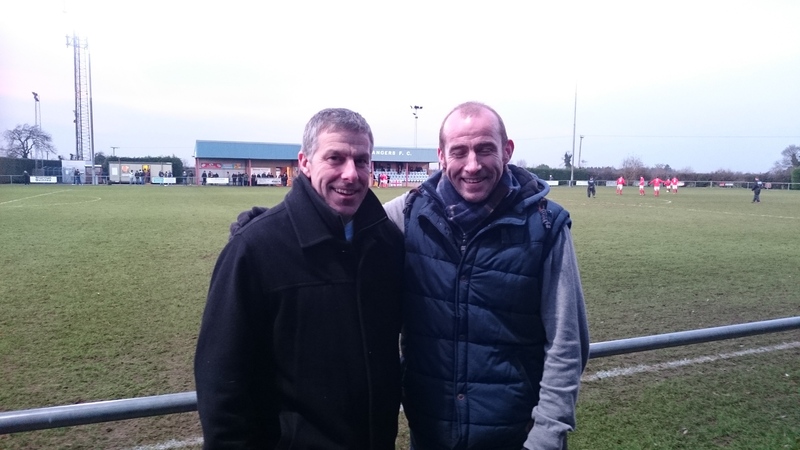 As the second half got underway – with Deeping throwing everything forward – to the left of the dugouts I’d found myself introduced to two of Worrell’s former team mates. Between the conversation, we craned our necks to see numerous close calls as, Coulson lead the charge, ably assisted by Jamie Graham, Dan Flack and Jordan Avis. With the cold night creeping in, Dave Simpson (Chris Beckett’s Assistant Manager) and Dean Tarrant (“on the other wing”) humorously recounted tales of Sterling both in the dressing room and on the pitch. Predictably there were wry smiles accompanying comments like “He didn’t tackle a lot but, he was good on the ball.” but, on the whole the recurring theme was that he’d been a pleasure to manage and play with. In front of us Heanor’s keeper was lucky not to be sent off after taking out Graham who was clean through however, just before time a thoroughly deserved equaliser arrived. Coulson crossed and Jamie Braithwaite bundled the ball home at the far post. Extra time could’ve gone either way; sadly it was the visitors who found their name in the hat for the fourth round, courtesy of an early Gary Ricketts header. Rangers had chances but they came to nothing. One Deeping effort was correctly ruled out for offside, and a second was fantastically cleared off the goal line by Ross Henshaw. As the locals drifted off into the night I bade my farewells just glad I’d picked this club to visit. As his career came to a close, Worrell retrained. Coaching youngsters and working in Posh’s Academy for a while, now he teaches Level 1-3 Sports Studies at Peterborough Regional College. With tales of students still searching for his football stickers, Worrell quite humbly told me “how lucky” he been. His Wembley days might be over but, now he delights in a quiet life, seeing others progress. 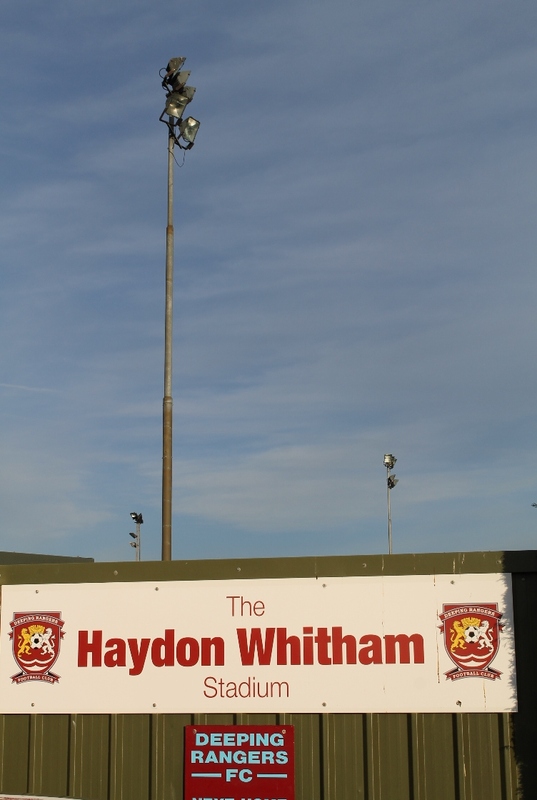 This entry was posted in #WFC1982, 2014-2015, FA Vase and tagged #WFC1982, Deeping Rangers FC, FA Vase, Haydon Witham Stadium, Heanor Town FC, Peterborough United FC, Rangers, The Deepings, The Posh, Worrell Sterling. Bookmark the permalink.